In the last post, I ended with the story of Isabella and Corrado but that’s not the end of my stories of Verona. Continuing on our exploration of Verona, we came across a lovely square with Fra Costera – a monk standing on a pedestal above the arch with a stone ball in hand. The legend says that this ball will drop if an honest person passes by under the statue. It has of course not fallen down so far ever, for who is really honest in this world? At the center of the square, Dante stands looking at everyone. Verona was the place where Dante seeked refuge when he was exiled from Florence. 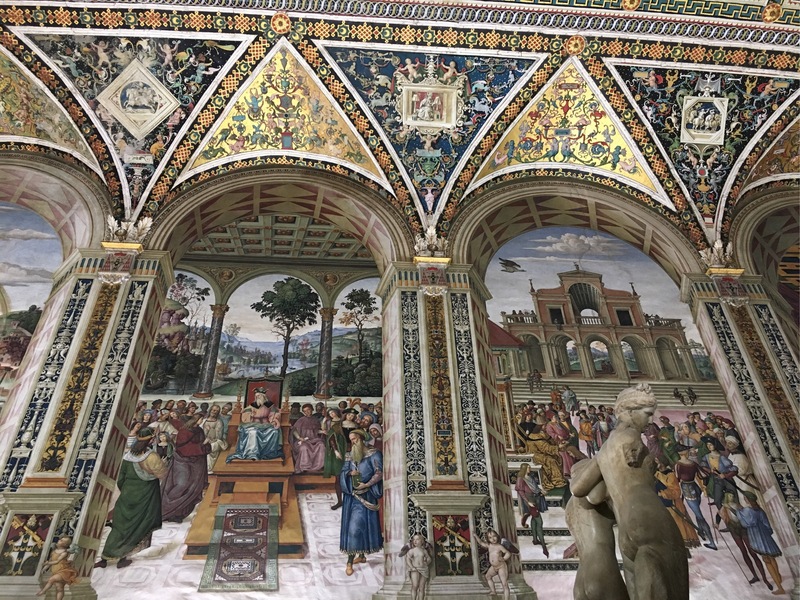 Probably as a gratitude, he dedicated the Paradise part of his masterpiece – Divine Comedy – to Verona, more specifically to the Cangrande – the library of Verona which is on the left hand side in the picture below. At some places we saw the symbol of city – a dog with a ladder. And almost everywhere we could see the colors of the city – red and white. See the cathedral below with the red and white stones to get an idea. We passed by the Church of St. Thomas where Mozart played a concert while still a child, Porta Leoni, the church of St. Fermo and St. Rustico, a street going into the Veronetta – small Verona. On the hills, we could see the Medieval Military buildings. Our tour ended at the oldest bridge of Verona – the Ponte Pietra. You can see the different colored stones there – the white ones are from the original bridge and had fallen into the river when the German army blew the bridge during the second world war. The locals pulled out those stones painstakingly from the river and rebuilt the bridge over a period of 10 years piece by piece. Then our guide sat down to answer our queries and give suggestions on what we could do next depending upon our interests. We thanked her with tips and took our leave. Since we had only about 2 hours left to return to our bus, we decided to do the touristy task of visiting Juliet. I wanted to see the Cathedral first so three of us took a different route than the other three co-passengers from the bus. The Cathedral was nice – not as magnificent as in Florence or Milan but serene. A service was ongoing inside as it was a Sunday, which felt so lovely. Then we found our way towards Juliet. I couldn’t catch her alone for even one moment. So here she is with someone who also, probably like me, felt inappropriate to grab Juliet’s breast which is supposedly the thing one should do here. I wonder who came up with that stupid idea in the first place. A side note – the same statue of Juliet – albeit not golden – stands in Munich too! Then we went to grab something to eat before heading back to the bus and call it a day. After the tiring day at Venice, the tour came to the camping site and it was time to get some rest. The bus was supposed to start early morning so I tried to make the best of the time by sleeping as soon as possible. But I somehow woke up too early and couldn’t get back to sleep. Anyway, finally after everyone was ready, we started on our return journey. The great thing – we stopped at Verona. That was wonderful because of two reasons – a) the sun was out b) we’d left the mad crowd in Venice. Once we got down, I rushed towards the place where the walking tour was supposed to start from. Having missed the opportunity in Venice, I was quite determined to not miss it here. So I reached the venue along with the two other girls that I had made friends with in the tour. We had some time to kill. The tea and some french fries at the McD there was not hurting anyone, so we sat down to get ourselves fuelled for the tour. Then we started the tour, quite on time, when the guide and all the people who wanted to take the tour were assembled. The guide told us Verona means “terrace on the river”. The city is on the river Adige and has a history of more than 2000 years! It was a Roman settlement in the 1st century BC. The most important ruling family was the Scaligeri family (also known as Scala) which ruled for around a 100 years between the 13th and 14th centuries. Then it came under the rule of Venice in 1405 AD. Later, it was taken over by Napoleon, then Austria before becoming part of the Kingdom of Italy in 1866. It is a Unesco world heritage site today. Quite a history! So the first thing that the guide showed us was this huge arch with a clock on it. This is the entrance to the old city. It is called Portoni della Bra. Then we made our way to the statue of the Bard who had chosen Verona as the setting of the romantic tragedy “Romeo and Juliet”. We briefly passed from the Arena – which is like a mini colloseum. We got to know that the word “Arena” actually means “sand” which was spread in such theaters to absorb the blood of the fighters (men, animals..all the same). Then the guide took us to the Castel Veccio also called Castello Scaligero. The walls of the fort were great overlooking the river and seemed quite popular for photos. Castel Veccio with King Tut! There were two rulers from the Scaligero family with the same name – Cangrande – first one was good and the second one as cruel as they come (nicknamed – Can Rabbioso – Angry Dog). He was assassinated by his brother. The rule of the Scaligero family didn’t last for too long after that. Within 25 years or so, Verona was part of the Venetian rule. In 1805, the castle was used as the Barracks for Napoleon’s army. On the road close to the castle, we saw some embedded white marble pieces and our guide asked us to make a note of them. Then we reached a beautiful stone arch overlooking the river. It was Arc de Gavia – Gavia being an influential Roman family in 1st century. Napoleon’s army had dismantled the arch to make way for advancing easily. 100 years later, the people of Verona collected the pieces and resurrected the arch in front of the river. The marble pieces seen earlier were at the original location of the arch. We reached the Jupiter Gate which must have had the temples of Roman Gods in the past. The San Seno Gate was where the Roman soldiers holding bags collected tax there – hence the name Porta Borsa (Gate of Bag). Once we went through that gate, we also saw a small piece of wall which had the Head of Medusa, thereby confirming that there must have been some Roman temples in that area. Then the guide showed us the place of origin of something very Italian – the Pandorro – which is the traditional Italian Christmas Cake! Domingo Meligati made the first Pandorro in 1894 in his bakery on this street. We passed Piazza Herbe which was the ancient Roman city center and the market for spices, the column of San Marco which shows the Lion with open book indicating it was constructed in the time of peace, the Justice Square – with a statue of a lady pointing a sword towards the skies asking for justice for the 14000 people killed in 1915 by Austrian armies in the WWI (in the old time, there used to be executions of convicts here). We also saw the Rib of a whale hanging between two buildings on a street. It was actually the advertisement for the pharmacy that has been there since the 1700s when the whale bones were supposed to have medicinal properties! Since we were in the city of the romantic tragedy, we came across another symbol of doomed lovers. It was a well. The protagonists of this story were Corrado and Isabella from the 16th century. The story goes that Corrado pursued Isabella incessantly but Isabella played hard to get. Then one day a fed up Corrado accused her of being as cold as the water in that well. Isabella asked him to jump into the well and see for himself if the water was indeed as cold as he thought. She was probably indicating to him that she wasn’t as cold but as the young men in love in the world of stories do, he took it literally and jumped into the well. Isabella, overcome by this turn of events, jumped into the well, to be forever with Corrado. At this story, I should probably stop and continue in my next post with the remaining things I want to write about Verona. Until next, arrivederci! I had been to Venice a really long time ago. It is an interesting city but all I recall is that I was just too exhausted and the weather was too grey for my liking. As fate would have it, I was there again recently and – believe it or not, with the same conditions – I was exhausted and the weather was again – GREY. Somehow Venice doesn’t seem to even try to impress me :-). Coincidentally, this fits the theme of the photo-challenge. But at least one thing was different – this time I saw the Carnival madness in town. Anyway, the dressed up people graciously posed for photos. It’s kudos to the management there that there was no stampede and nothing untoward seemed to occur. The crowd was so huge that it reminded me of some of the famous pilgrimage places in India! If you don’t know how it is, then consider yourself lucky. You are not missing anything. I don’t know if Venice would call me again but if it does, then I do hope that it would be in better conditions. As they say, “third time is a charm”! It’s quite a coincidence that the theme of the photo challenge is “Layered” which was the exact feeling I have from my recent trip to Italy. Why, one would be curious..
That’s because the present day Italy has several layers of civilizations underneath it. I am not sure which city of Italy wouldn’t have ruins of as far as the Roman times, if not even older, under it. 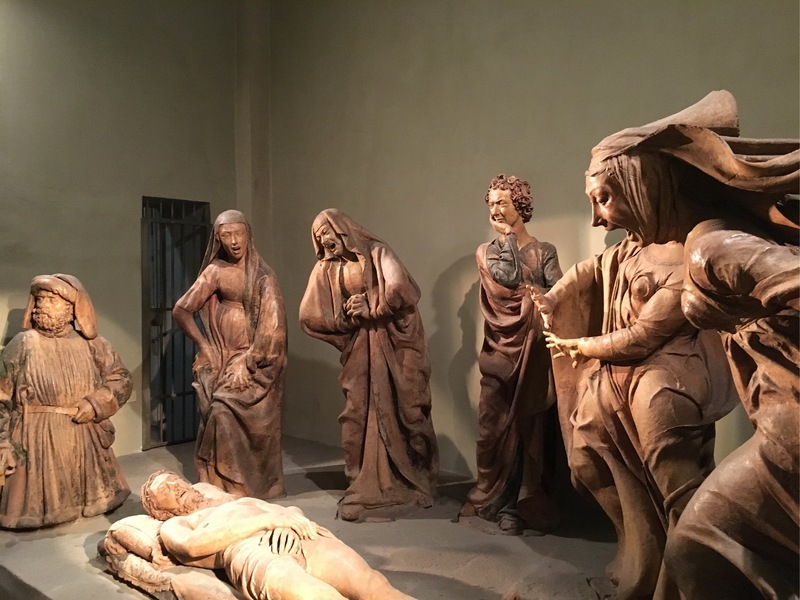 But for the photo challenge, I’d like to present these terracota statues – “The Compianto” made by Niccolo dell’Arca in the 15th century, which are today housed in the Sanctuary of Santa Maria della Vita, in Bologna. The statues are so lifelike that it feels like someone froze a moment in time. Now what is the connection to layers here? The traditional statue making with stone involves chipping off the stone but in terracota, one needs to add one layer over the other to achieve the effect. It was considered by sculptors of the likes of Michelangelo an inferior form to create something by adding (putting layers of clay) than by removing (chipping off marble)! To each his opinion. 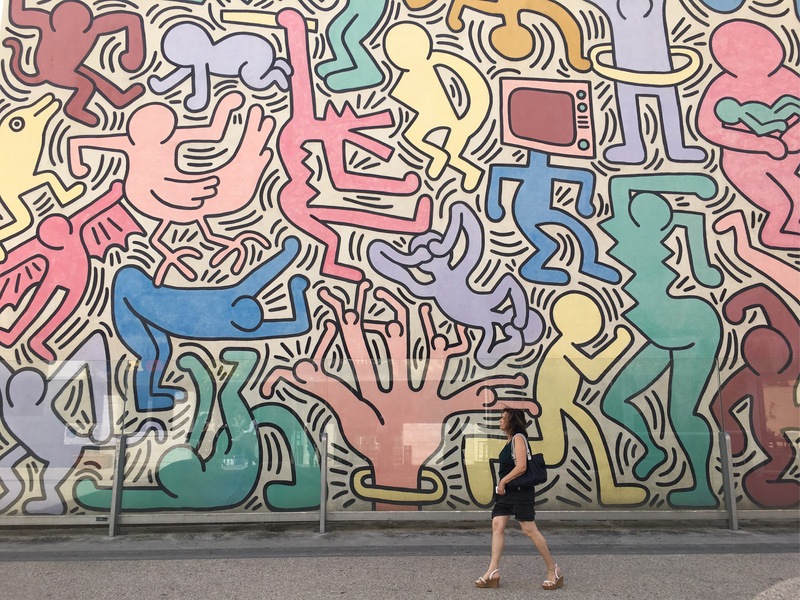 My opinion is that art forms are means of expression of the same thing inside us human beings that wants to come out – and hence, no form can be inferior or superior. A form can be easier or difficult to work with – but ultimately, it is the end result that is important. Does the work on display evoke any emotion in the observer? If yes, then it’s good work. If not, then it probably could be made better. For more interpretations of the theme, you can visit here. The Clouds with the message..
As I was waving away goodbye to Italy, little did I know that the return journey would become so long. First the flight didn’t start on time – stood in that queue for almost 1.5 hours because in this cheap flight, they don’t let you in sequentially but rather haphazardly. So everyone just queues up to avoid problem later with no spaces left for the carry on luggage. Finally it started and I went to sleep. When I woke up, it was being announced that we would be landing soon although the weather conditions don’t look good. I was thinking of my options from the airport once the flight lands. And then all of a sudden, the pilot made the announcement that the flight will go to another airport which is about 125 km away from the airport at which we were supposed to land! Reason given was weather conditions. But I think it had something to do with the delayed arrival too. Everyone looked at one another incredulously but what else could we do? A little muttering started among people. Finally we landed and waited in the aircraft while the crew was getting the information about what would be done. Then after some time, they let us disembark and told us that there would be a bus arranged to go to the other airport and “most probably there would be information at the terminal”! Not very promising but again, what could you do? I remember one such incident in India with a local low cost carrier there. They served us water and snacks for free while we waited for more information and then they flew that flight to the correct destination! But probably there it was a strategic move to prevent the situation from getting escalated – we all know the passion that warm countries can generate :). Reached the main airport at around 23:10 hrs. But it is so huge, it was difficult to get the ticket, figure out where the train would be arriving, reach the platform and board the earliest train. You know the drill. The next train was at 00:28 hrs. Not any better than the shuttle that I could have waited for at the previous airport. But it just felt safer here waiting than at the other airport which is in the middle of nowhere! It did need a train change at one station. So it was risky due to possible train delay. But I took the chance. The first train was delayed but thankfully the connection was from the adjacent platform (no running needed) and was also delayed. So I managed to reach as planned. Then took a taxi home. Finally sometime between 2 and 3 am, I was at home. And did I mention that temperatures were arouns 10 degrees outside and I was clothed according to the 22 degrees of Italian temperatures? Was so exhausted but grateful to be safely at home in the warmth of my blanket and went to sleep immediately. Looking back, it seems that the real adventure was in returning..
Alas, the trip has come to an end. As they say, the body is tired but the soul is longing for more. Looks like I’ll have to come again. Italy had captivated me long ago when I came here for 2 days in 2005. One day was spent in Rome and one in Venice – a whirlwind trip. I can’t believe that it took me 12 years to be able to visit this lovely country again. I hope the next trip is sooner. About today then. I woke up this morning at a lazy pace, had a slow breakfast and then had the major task of packing everything back in the suitcase. I need the charm that I saw Professor Lupib use in the Harry Potter movies! It was such a time consuming task – to compress everything and fit into the carry-on luggage and that when I hardly bought anything here (so much self control – I must be reaching the gyaan stage of the Buddha!). 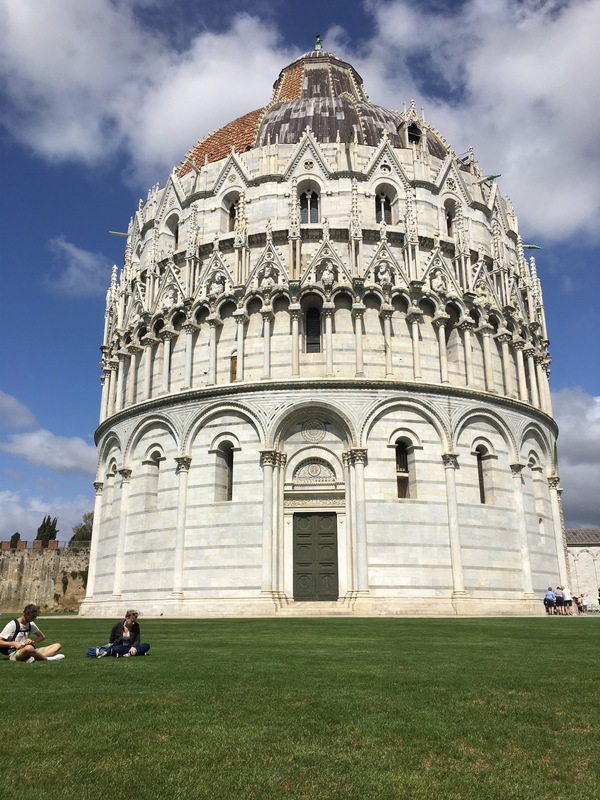 So I came to Pisa from Florence – this time I did take the train that was in 10 minutes. Took the chance and it worked :). The first thing at the Pisa station – the airport shuttle (mini train) goes every 5 minutes from there and costs 2.70 Eur one way. There is a machine at the same place from where the train leaves. It is not the same as that for normal trains. The Tabacci at the station very patiently and genially answered my queries about the regular bus and airport shuttle. The regular public bus can take you to the tower. Ticket one way costs 1.20 Eur and valid for 70 mins after stamping in the bus. 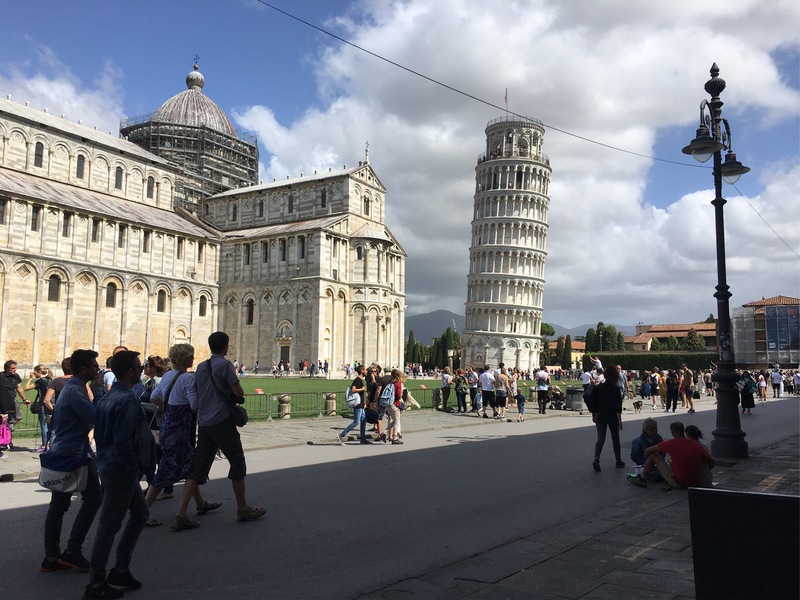 I noted the location of the shuttle departure (at the end of the platforms – there are 13 of them) and then went on my exploration of the famous architecture of Pisa. It was perfect to be able to see all the buildings in just one location with green grass lawns around. I lightened my luggage by having the food that I had brought along. Sat at the lawns and enjoyed the view. Since I had started late, I didn’t have time to go inside any building. Now I need to board my flight. I checked the temperatures back at home and it is going to be so different there after all the sun and warmth in Italy. Until next – Ciao Italy. According to the Old Testament, God created everything in 6 days and rested on the 7th. I can imagine why us humans would think that – we get exhausted after 6 days and need to rest – whether at work or on vacation , as has been my experience since the last one week. Today morning I was just not in the mood to venture out for anything. It was raining in the night and I had again a broken sleep. But then at around 9 AM, I saw that the sun was peeking out. That encouraged me a bit as then it would feel like committing a sin to keep sitting inside the hotel. So I got ready, had breakfast and did a kind of “Eena Meena mina moe” to decide between Lucca and Siena as the destination for today. Siena won. At the train station, I bought the ticket that gave me 25 minutes – you know why! Then located the right platform after asking a trenitalia staff member. It was hidden behind due to some renovation work going on at the station. The train looked rather small – I guess 3 carriages only. The driver was a young guy and just went past us in the carriage and entered his cabin through a door within the carriage. That was unusual – I had never before seen a train driver get inside his cabin through the passenger seating area. Then after about 1.5 hr of journey (sleeping intermittently), the train reached Siena. I had read on the net that there is some kind of escalator going up from train station to the city. The posts were from 2011 and peope were discussing in it the ongoing construction. Now it is all running very well – I can tell from first hand exprience today. There is a shopping mall opposite the station. Just keep going up in it using the escalators and you would reach the town. Upon exiting, go left and keep going until you reach a medieval style gate on your right hand side through which majot traffic is passing by. You have to enter that and then just follow the crowd. You would reach the city center. Siena is a town which had rivalry with Florence. While Florence became the main center of Renaissance, Siena retained the Medieval character. I stopped for a coffee and rest room break as the train journey had given me a headache. Then proceeded to the Piazza del Campo while peeking into the smaller churches on the way. The piazza was circular with a stunning huge tower on the arc. Lots of people were just sitting there and enjoying the feeble sun. I also sat down to eat something as it was lunch time. People were either at the restaurants or at the piazza with their sandwiches etc. Kids were running after the pigeons and parents after the kids. Thus taking in all the scenery and relaxing my feet, I moved ahead. 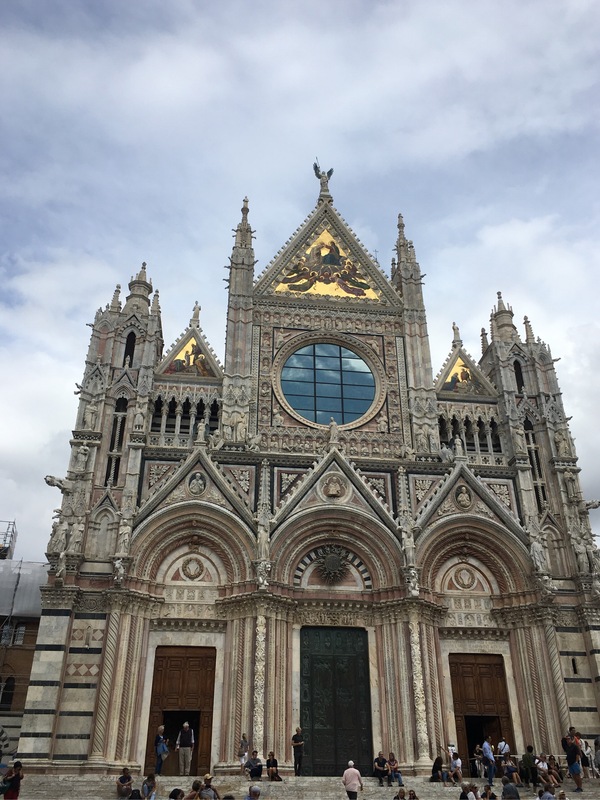 The guides yesterday had told that Siena had a huge cathedral and Florence had built its Cathedral to score on Siena. So of course I wanted to see the cathedral here. There was a OPA ticket that allowed to visit 5 places. I took that though wondering if I would have enough time to see everything. I managed by skipping the panoramic view for which the queues were really long with a waiting time of 1 hour. The cathedral was indeed impressive but after having seen the one in Florence before it, it seemed just fine. But I am glad that I went inside. I had not seen these bright colors inside a church before this one. It was just awesome. And in addition, there was a library inside which was also lovely. I saw the hand written books on display with beautiful artwork as was the way before the printing press of Gutenberg. Then I went to the museum, baptistry, crypt and oratorium in that sequence. The panoramic view was through the museum but I skipped it as I wanted to see the other things before they closed. 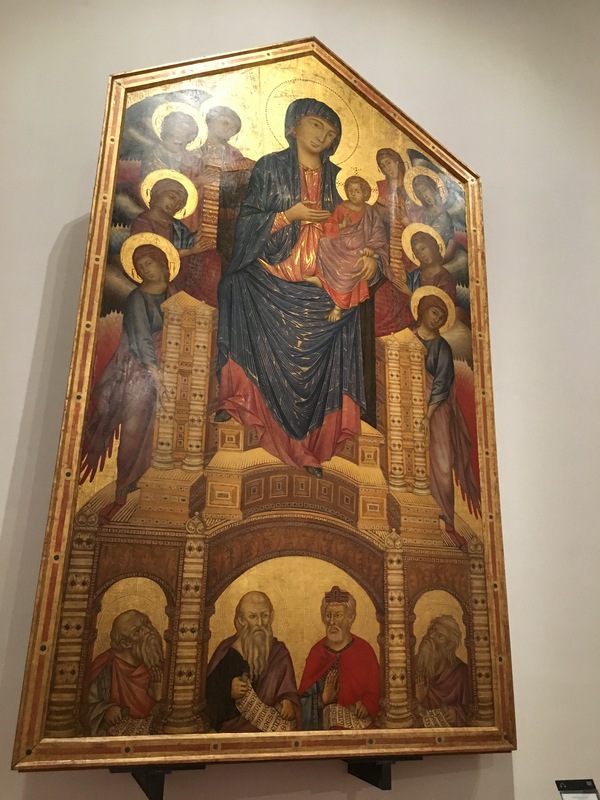 The amount of religious art from the middle ages that I have seen in the last 3 days is enough to make me see green faces, and babies with adult features in my nightmares! The reason is that the skin tone was made by first giving a green base and then coloring on top. Over the centuries the top coats have faded and one can see the green underneath. And regarding the adult face – for whatever reason, the artists in medieval times had to represent Jesus as a homunculus man – perfectly formed but small. But the sculptures and architecture works that I have seen makes up for it. They are just marvelous. 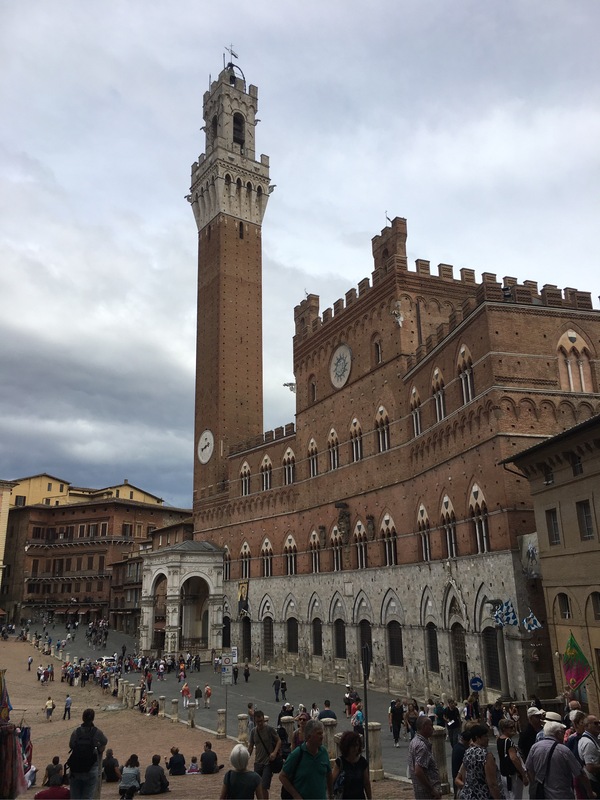 I wanted to spend some more time in Siena but was afraid that I might reach too late to Florence, as it is about an hour and half journey plus the time to reach the station and waiting for the train. It had also started raining a bit so I set off. After having missed one by a few minutes, I took the ticket for the next direct one which was one hour later, grabbed some dinner from a lovely salad shop (make your own combinations), returned to the station, found the train and came back home (hotel after 2 days starts feeling like home). Oh, I forgot to mention – a daily dose of sorbet/gelato is also being taken during all the sightseeing. It’s not cheap here considering it’s the source but it’s superb. So that’s the end of day 7. Tomorrow is the day of return. Hopefully everything will go smoothly. Ciao for now.